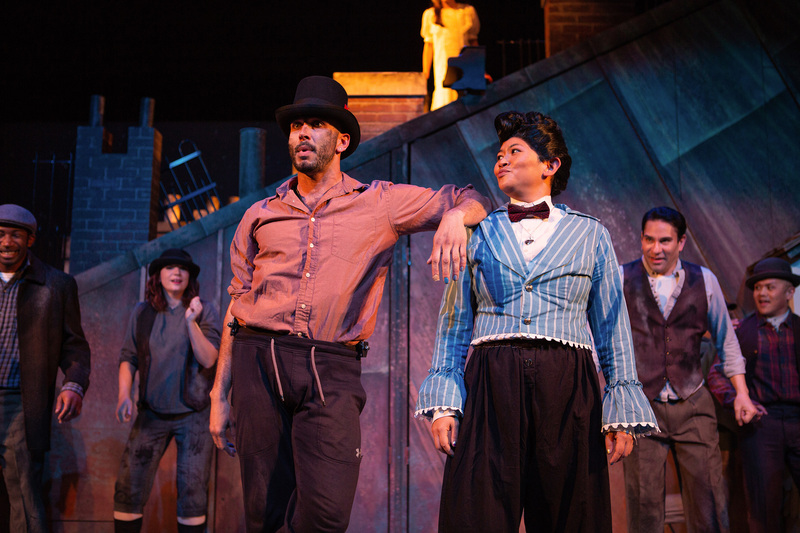 Wiley Naman Strasser as Bert and El Beh as Mary in SF Playhouse’s production of Mary Poppins. Photo Credit: Jessica Palopoli. In the popular Disney film of “Mary Poppins” a chorus of animated country folk gleefully trill, “Um diddle, diddle, um diddle aye” and it is as charming and gentle as can be. In the current stage version of “Mary Poppins” at SF Playhouse, we also hear “Um diddle diddle, um diddle aye” but it is not reassuring. It is a low, almost frightening rumble, as if threatening an approaching storm or an evil fate, something strange and discombobulating. What gives? The strange and discombobulating creature who approaches is Mary Poppins as P. L. Travers imagined her, not the lily white, middle class, well-spoken, well mannered (and deservedly well-loved) confection-like creation of Julie Andrews. This Mary Poppins is rather—well, let’s say it—decidedly queer and challenging by comparison, a fact not unnoticed by director Susi Damilano, who doesn’t miss a trick in bringing the story to complex life. The remarkable El Beh is the perfect Mary for this production. El Beh (whose preferred pronoun is “they”) is a performer of astonishing versatility. To peruse their resume of major roles in the Bay area is to wonder, “could this possibly be the same performer?” They (El Beh) are many persons, it seems, but rarely have we seen them as happily cast as here. Charming, gentle, seductive, and kind, El Beh’s Mary nevertheless sends chills up the spine with the addition of something extremely peculiar and oddly threatening. Threatening to some, that is. This Mary Poppins clearly takes sides, and she (El Bey may be they, but I do think of Mary as she) is clearly more on the side of the scruffy, working class, possibly homeless street artist and chimney sweep Bert (played with great charisma and conspicuously eloquent dancing by Wiley Naman Strasser) than she is with the upper class Banks family, even the snotty children Jane and Michael, whom she has come to rescue from themselves. Do I make it sound too serious? Heaven forbid! While there is a hard queer edge to these two characters (Bert and Mary) who go to work on the Banks family, there is no shortage of charm and magic either. All the favorite songs from the movie are here (if somewhat changed) as well as some excellent new ones. Children and their parents will be delighted when Mary begins pulling impossible items (such as a full sized hat rack) from her carpet bag—just like in the movie—or magically restores a kitchen disaster to order with dishes stacking themselves and a cake producing its own frosting. Speaking of children and their parents, let’s talk about the Banks family. Ryan Drummond is better than fine as Mr. Banks, a man whose heart of gold has been confused and abused until he can’t show love to his wife and two adorable children. Well, actually, not so adorable. The Banks children, like Banks pater, might be full of potential sweetness, but they have a long way to go before they show it. Middle schoolers Ruth Keith and David Rukin, who played Jane and Michael on opening night, are consummate professionals, and deliver plenty of emotional punch, skillfully maneuvering from spoiled brats to thoughtful young people. Unexpected and unforgettable is the character of Miss Andrew, the “holy terror” who was Mr. Banks’s childhood nanny, and clearly responsible for damaging him badly. As performed brilliantly by Katrina Lauren McGraw, Miss Andrew is a comic horror, and memorably delivers the show’s best musical number, “Brimstone and Treacle,” featuring a mind blowing high F. She also shows her versatility by doubling as the gentle bird lady on the steps of St. Paul’s. Overall, “Mary Poppins” should delight families looking for a holiday treat, and offers a great deal more than sweetness and light. Be prepared: very young children might be overwhelmed by a sequence in which toys come rather threateningly to life to teach Jane and Michael a lesson in caring, or by the scary Miss Andrew. But, of course, it all ends happily, doesn’t it? “Mary Poppins” continues at SF Playhouse through January 12, 2019. For further information, click here. “Mary Poppins,” a musical based on the stories of P.L. Travers and the Walt Disney Film. Original music and lyrics by Richard M. Sherman and Robert B. Sherman. Book by Julian Fellowes. New songs and additional music and lyrics by George Stiles and Anthony Drewe. Co-created by Cameron Mackintosh. Director: Susi Damilano. Music Director: Katie Coleman. Choreographer: Katy Richards. Scenic Designer: Nina Ball. Lighting Designer: Patrick Toebe. Sound and Projections Designer: Theodore J. Hulsker. Properties Designer: Jacqueline Scott. Wig Designer: Laundra Tyme. Bert: Wiley Naman Strasser. George Banks: Ryan Drummond. Winifred Banks: Abby Haug. Jane Banks: Grace Hutton/Ruth Keith. Michael Banks: Billy Hutton/David Rukin. Katie Nanna/Mrs. Corry/Ensemble: Sophia LaPaglia. Policeman/Von Hussler/Ensemble: Rudy Guerrero. Miss Lark/Miss Smyth/Ensemble: Kathryn Han. Admiral Boom/Bank Chairman/Ensemble: Anthony Rollins-Mullens. Mrs. Brill/QueenVictoria: Marie Shell. Robertson Ay/Park Keeper/Ensemble: Rod Voltaire Edora. Mary Poppins: El Beh. Neleus/Northbrook/Ensemble: Dominic Dagdagan. Bird Woman/Miss Andrew/Ensemble: Katrina Lauren McGraw. Valentine/Ensemble: Gina Velez. Ensemble: Catrina Manahm. Dance Captain: Anthony Rollilns-Mullens. 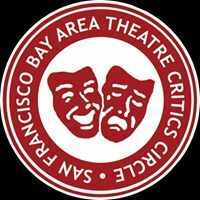 Posted in Reviews.Tagged Charles Kruger, David Rukin, El Beh, Katrina Lauren McGraw, Mary Poppins, P. L. Travers, Ruth Keith, Ryan Drummond, San Francisco Playhouse, Susi Damilano, theatrestorm, Wiley Naman Strasser.